The Global Volcanism Program has no activity reports for Licto. The Global Volcanism Program has no Weekly Reports available for Licto. The Global Volcanism Program has no Bulletin Reports available for Licto. The Licto group of scoria cones lies along the Río Chambo about 25 km SE of the city of Riobamba and just north of the town of Licto. These three basaltic-andesite to andesitic cones form the southernmost area of Quaternary volcanism in the Interandean valley of Ecuador. The basaltic-andesite Cerro Tulabug at 3336 m is the highest of the cones and rises 3 km NW of the town of Licto. Loma Bellavista, 2 km NE of the town, is a 3113-m-high andesitic scoria cone. A third cone, Licto, is of basaltic-andesite composition. The group was considered to be of late-Pleistocene or Holocene age (Hall, 1987, pers. comm; Eissen, 2006, pers. comm.) based on the relatively youthful morphology of the cones. Eissen J-P, 2006. (pers. comm.). The Global Volcanism Program is not aware of any Holocene eruptions from Licto. If this volcano has had large eruptions (VEI >= 4) prior to 10,000 years ago, information might be found on the Licto page in the LaMEVE (Large Magnitude Explosive Volcanic Eruptions) database, a part of the Volcano Global Risk Identification and Analysis Project (VOGRIPA). There is no Deformation History data available for Licto. There is no Emissions History data available for Licto. Cerro Tulabug (right-center), part of the Licto group of basaltic-andesite to andesitic scoria cones, is seen here from the SW. The cones lie along the Río Chambo about 25 km SE of the city of Riobamba and just north of the town of Licto and form the southernmost area of Quaternary volcanism in the Interandean valley of Ecuador. 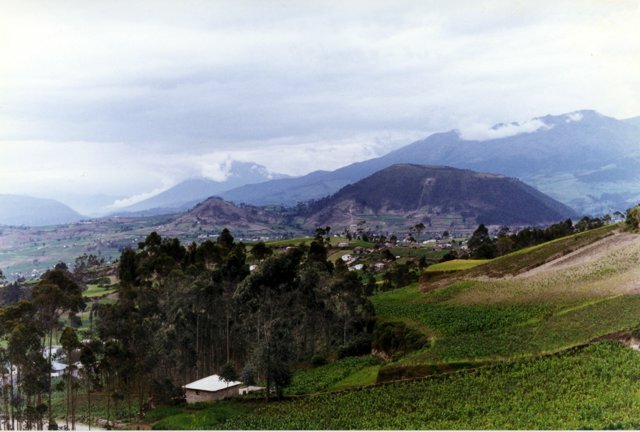 The cloud-draped conical volcano in the left-center background is Reventador, and the Cordillera Real forms the right horizon. Photo by Patricio Ramon, 1998 (Instituto Geofisca, Escuela Politecnica Nacional). The Global Volcanism Program has no maps available for Licto. There are no samples for Licto in the Smithsonian's NMNH Department of Mineral Sciences Rock and Ore collection. Large Eruptions of Licto Information about large Quaternary eruptions (VEI >= 4) is cataloged in the Large Magnitude Explosive Volcanic Eruptions (LaMEVE) database of the Volcano Global Risk Identification and Analysis Project (VOGRIPA).